This work is devoted to the numerical approximation of a system of advection-diffusion equations set in adjacent domains and coupled with nonstandard matching conditions. The specific application of the model at hand is the study of the transfer of chemicals through media of heterogeneous nature, for instance a free fluid and a porous medium. After a brief description of the model, we focus our attention on its numerical treatment. In particular, since our model couples subproblems in different media, we study an iterative procedure where the solutions provided separately on each sub-domain are suitably matched (a so called iterative substructuring method). More precisely, we consider a strategy based on Robin interface conditions for both subdomains. The convergence of this iterative strategy is analyzed at both the continuous and the discrete level. Moreover, an algebraic reinterpretation of this technique is provided, leading to the definition of optimal preconditioners for the linear system arising from the discretization of the global problem. 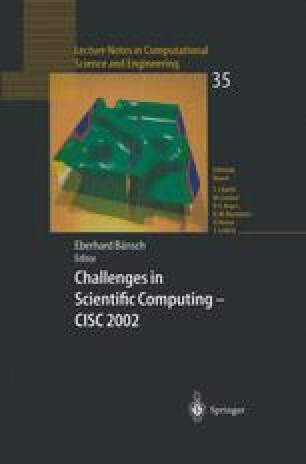 Finally, numerical results are presented, in order to assess the computational efficiency of the numerical methods proposed.